No one was hurt but a house is destroyed after a fire that started when a resident was thawing frozen pipes. City Fire Captain J.D. 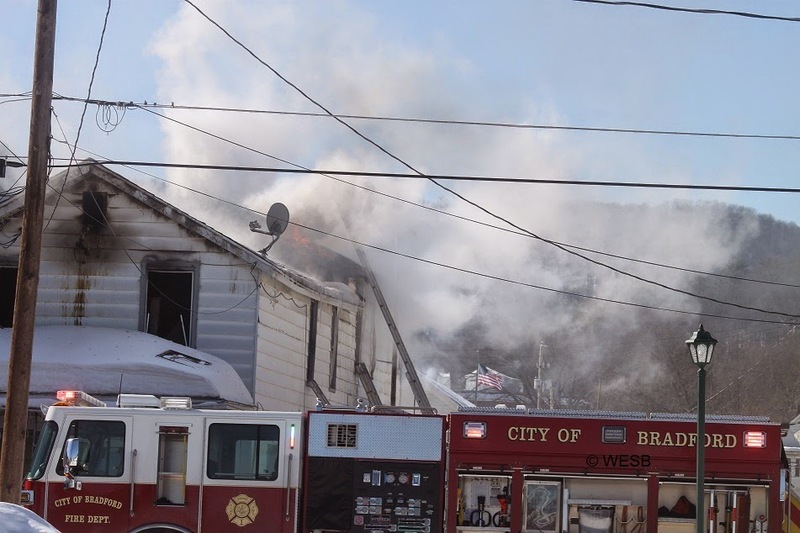 Tehle tells WESB the owner was using a heat gun to thaw the pipes at 11 Pearl Street, and thought everything was fine but there was a spark in the blown-in insulation, and the fire quickly spread throughout the house. He added that while they were looking in the crawl space, smoke was coming from the eaves. “It just travels that fast," Tehle said. The fire eventually spread to an apartment at 9 Pearl Street, which ended up with minimal damage. Anita Hubbart and her three children were able to get out of 11 Pearl Street safely. The Red Cross is helping them and the resident of 9 Pearl Street. Taylor Roofing owns the buildings, which are insured. Tehle said there were no problems with the cold – it was 5 degrees when they were called out at 12:40 p.m. – and they had enough water and manpower. They were there until about 4:40 p.m.
“We weren’t going to take any chances," he said. Lewis Run was on standby at the Central Station. You can see more pictures at facebook.com/1490wesb.